Our incredible Double Sided Doona Cover Set’s give you the option of mixing and matching your bedroom colour palette as you please! Whether you are needing a little inspiration for styling your new Pewter & Silver bedding or just wanting to change up your current style – we have got you covered! Continue reading to check out some of our fave #yohomeau set up’s featuring our Double Sided 100% Bamboo Pewter & Silver Doona Cover Set ! Tired of trying to find the perfect bedding? We feel you. That’s why we offer fuss-free bedding that’s 100% organic, high quality, good for your skin, and as soft as clouds – I mean, how could you say no to this cuddly den styled by the gorgeous Louise! 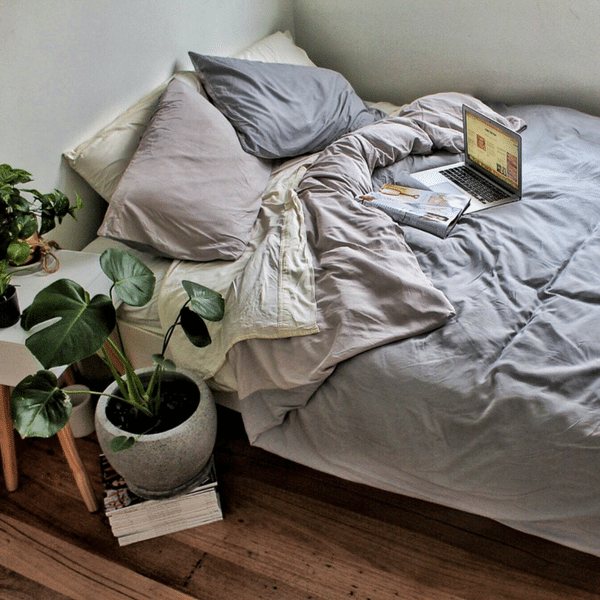 “My new @yohomeau sheets are making it hard to get out of bed! They’re 100% bamboo and literally the softest sheets ever!” Adorable Natyse opted for our Pewter & Silver Doona Cover Set in her beautifully styled room! Sleep healthy, sleep well just like beautiful Bonny! Pairing our Pewter & Silver Doona Cover Set with our Silver Sheet Set – creating an eco-friendly haven! How adorable are Hannah & Evaliah in their matching PJ’s! Snuggled up on our Pewter & Sliver goodness & 100% Bamboo White Sheet Set! Oh my! Cuteness overload! Bamboo sheets are naturally antibacterial and repel bed and dust mites but definitely don’t repel cuteness like Jenna’s kitty Yolandi – Bamboo sheets also repel germs and odours so sharing with your fury friends, smelly or not is no problem! Our Pewter & Silver looking dam fine with our Ivory Sheet Set!